Zach contributed to a wedding video proposal for a couple in the UK. Zach is utterly charming. And so is the video. I couldn't see the groom very well, but based upon his amazing proposal artwork on camera, I'd marry him in a second (as well as Braff). Check out this charming video where "Scrubs" actor (and hottie) proposes to the this dude's wife. I found it on Huntington-Post in an article titled: "Matt Hulbert Gets 'Scrubs' Star To Help Him Pop The Question". Hulbert also enlists family and friends to contribute their vote for a "Yes" answer the proposal in video and then compiles it all into the most beautiful and clever representation of love...without being disgusting. Although, it might be self-serving. Hulbert's career as a "graphic designer" into a larger trajectory as a result of this. There are so MANY vignettes in this short video. 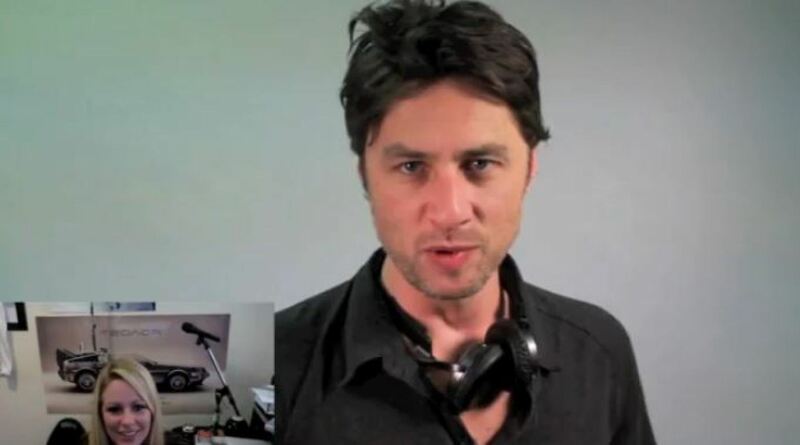 Somehow, it's Braff's star power and charm, though, that truly sets the tone. Personally, I found the two dudes, one who worked for EasyJet Airlines, filmed several "responses" in glorious European cities. This is really a wonderful show of love. And evidence of many talented people.